Saturated hydrocarbons constitute the majority of oils and fuels and they are distributed among a large number of isomers whose number grows in a combinatorial series with size. However, natural synthesis prefers only a small fraction of all possible isomers. The isomeric content and distribution affects all the major physical and chemical properties of oils and fuels, including: combustion efficiency, octane number, flash point, viscosity, lubrication properties, solubility and solvation power, boiling points and melting points. However, since current instrumentation can not be properly used for isomer distribution analysis this important subject is being ignored, as discussed in another post in this blog. As a result, organic geochemists currently attempt to characterize oils and lead oil explorations based on information gathered from ppm range biomarker compounds such as hopanes and stearanes instead of using the information content in the majority hydrocarbon isomers. 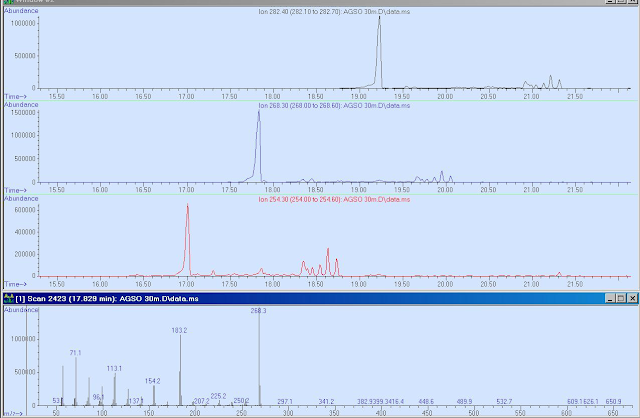 The Aviv Analytical 5975-SMB GC-MS with Cold EI provides, for the first time, a unique opportunity to explore isomer abundance distributions in order to correlate between them and other various oils and fuels features. In this post we measure and attempt to evaluate the importance of isomer distribution (abundance) analysis in organic geochemistry samples. For further information on GC-MS with Cold EI and on the possible use of isomer abundance analysis for fuel characterization please refer to the paper "Hydrocarbons and Fuel Analysis with the Supersonic GC-MS - The Novel Concept of Isomer Abundance Analysis", Alexander B. Fialkov and Aviv Amirav. J. Chromatogr. A. 1195, 127-135 (2008). 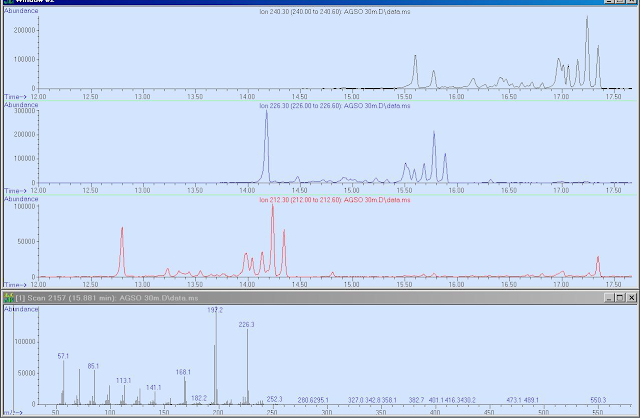 The main features of the Aviv Analytical 5975-SMB GC-MS with Cold EI include enhanced molecular ions which are observed and can be abundant for all isomers, combined with isomer related structurally informative fragments mass spectral peaks. In addition, extended range of compounds are amenable for analysis to include low volatility and thermally labile compounds that cannot be analyzed by standard GC-MS and unlike ESI-LC-MS it provides uniform response to all compounds for improved quantitative analysis. Keep reading to find out how the Aviv Analytical 5975-SMB GC-MS with Cold EI enables a new type of oil characterization and analysis for improved organic geochemical information and oil exploration. Injection: 1 uL at 280ºC with sample dependent split ratio. Sample: Geochemical oil samples A an B after their partial LC cleaning separation in n-hexane. These two samples were provided by two different sources. He column flow rate: 1.2 ml/min for 30 min and 0.6 ml/min ramp until 5 ml/min. Oven: 60ºC for 1 min followed by 8ºC/min to 330ºC and 4 min hold for total of 38.75 min (sample A). SMB source: 12 mA emission, 70 eV electron energy, 61 ml/min He makeup flow rate. SMB transferline temperature: 250ºC for 24 min followed by a temperature program of 8 ºC/min to 300ºC (30 m column). 5975 mass spectrometer: 50-700 amu at about 2.2 Hz scan frequency. Molecular ions are exhibited for all the sample compounds including the highly branched hydrocarbon isomers and hopanes. The data could be processed via reconstructed mass chromatograms on the molecular ions, thereby uniquely exposing the isomer distributions since they all have abundant molecular ions in Cold EI. We feel that this type of analysis is a potentially new and very useful tool for organic geochemical samples characterization. Thus, it can serve for an entirely new and unique type of studies and publications. Unique isomer mass spectral effects (mass peaks) were observed that can help in isomers structural elucidation. 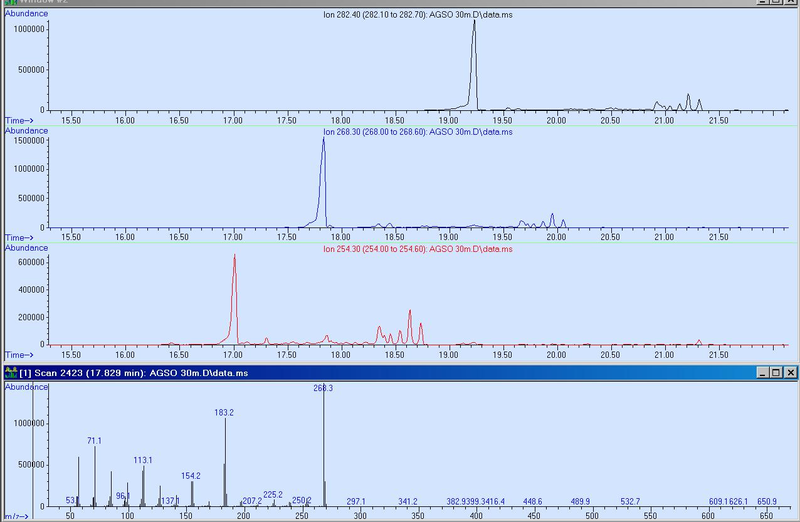 Figure 1 shows the analysis of an organic geochemistry oil sample "A" performed by the Aviv Analytical 5975-SMB GC-MS with Cold EI. 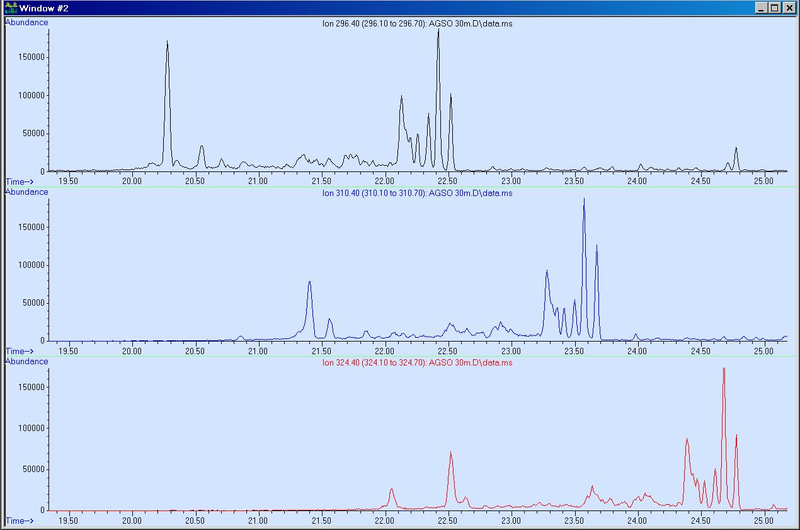 While the TIC looks similar to what is obtained with standard GC-MS, the Cold EI mass spectra are richer in information. For example, the mass spectrum of one of the hopanes shown at the bottom MS trace exhibits a noticeable enhancement of the molecular ions. Figure 1. Sample "A" TIC mass chromatogram obtained with 30 m column and 1.2 ml/min helium flow rate. The bottom trace shows the Cold EI mass spectrum of one of the hopanes with an abundant molecular ion at m/z 440.5 which is shown with some coelution of a heavier hydrocarbon (m/z=462.5). We note that background subtraction or RSIM clearly show that the 440.5 and 462.5 mass spectral peaks belong to different compounds. Click to Enlarge. As commonly practiced we made a reconstructed single ion monitoring (RSIM) mass chromatogram on m/z=191.1 to find the hopanes as shown in the bottom trace of Figure 2,. The RSIM plot on m/z=440.2 (one of the hopanes molecular ions) shown in the upper trace of Figure 2 is uniquely obtained by Cold EI. This allows the geochemist to gain new insights on the identity, amount and distribution of hopane's isomers. Figure 2. 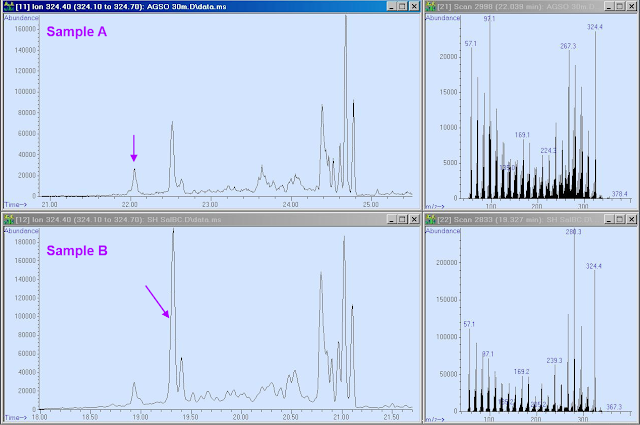 RSIM mass chromatograms of the known hopane m/z 191.1 fragment and the m/z 440.5 molecular ion (unique to Cold EI) of one of the hopanes. Click to Enlarge. However, while hopanes and other biomarker compounds provide valuable information, saturated hydrocarbon isomers constitute the majority of the oil, and thus it seems logical to analyze them and explore the information they provide with the 5975-SMB GC-MS with Cold EI, which is the only GC-MS available that provides molecular ions to all the branched isomers with good sensitivity. A possible conjecture is that when planktons degraded into oil, they formed isoprenoid hydrocarbons, which in-time further isomerized and/or decomposed into other compounds including linear chain hydrocarbons. Thus, isomer distribution analysis could provide a wealth of information on the history and origin of the oil. The wealth of information that can be extracted from isomer distribution analysis is demonstrated and discussed further with the aid of the following figures. Figure 3. A demonstration of the concept of Isomer Distribution Analysis (IDA) via the RSIM plots on the molecular ions, m/z= 296.4, 310.4 and 324.4, of C21H44, C22H46 and C23H48 respectively. Click to Enlarge. As observed in Figure 3, each RSIM trace is characterized by a distinct pattern of several peaks, where each additional carbon atom is accompanied by an increase of about 1.15min in its retention time. As shown, the isomer distributions span 3 min of elution time, which is greater than their separation from neighboring bigger or smaller hydrocarbons. Standard GC-MS cannot distinguish between these different isomers since normally their molecular ions are missing from the mass spectra. Note that the oil sample "A" is itself an LC fraction, already separated from linear chain hydrocarbons. As shown, all the late eluting isomers (which are likely to be less branched hydrocarbons) form similar distributions. Meanwhile the first-to-elute major peaks, which are isoprenoid hydrocarbons with side methyl groups every fourth carbon atom, vary in signal intensities (significantly) from one hydrocarbon isomer family to another. Other highly-branched hydrocarbon isomers also show some differences. Figure 4. Isomer Distribution Analysis on the most abundant compounds in the oil Sample "A". 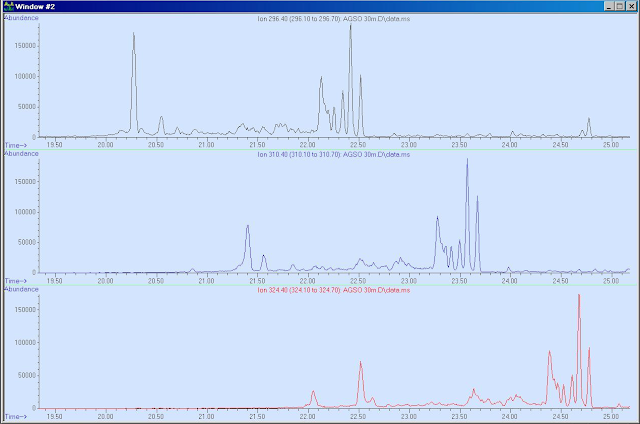 RSIM mass chromatograms of three hydrocarbons C20H42, C19H40 and C18H38 are plotted plus Cold EI mass spectrum of Pristane (bottom trace). Click to Enlarge. As shown in both Figures 3 and 4, each RSIM plot shows the hydrocarbon isomers' unique pattern structure that could possibly depend on the sample’s geographic origin, date of production and method of cleaning and/or processing. The bottom mass spectrum is of the dominant C19H40 isomer peak of pristane, showing unique structural information which allows its easy identification among other isomers even at low levels in complex mixtures. Note that in the upper and middle RSIM mass chromatograms in Figure 4, phytane and pristane peaks are the largest compared to all other isomers. Also note that all three compounds in Figure 4 show isoprenoid peaks that are relatively bigger than those of the heavier hydrocarbons shown in Figure 3. Thus, we clearly see a trend in the ratio of isoprenoid peak heights to other isomer peaks, which could serve to further characterize the sample. Figure 5. 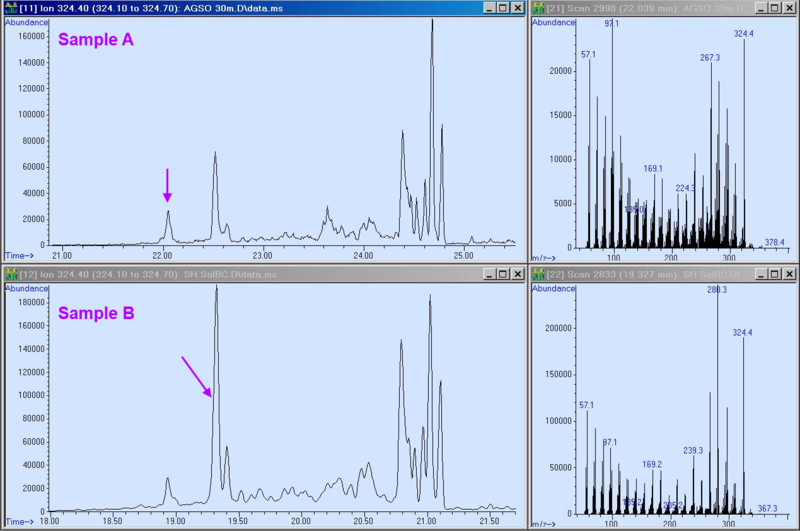 RSIM mass chromatograms of three hydrocarbons, C17H36, C16H34 and C15H32 from Sample "A" on their molecular ions, shown with their unique patterns that might hint on the sample’s geographic origin, date of production, and method of cleaning. The bottom mass spectrum is of the C16H34 isoprenoid isomer peak and it shows rich structural information. Note that this peak is relatively more intense in the C16 isomer distribution pattern than in the odd carbon number C15 and C17 neighbors for some reason. Click to Enlarge. Figure 6. Ratio of the isoprenoid isomer abundance to that of the last to elute isomer for the detected hydrocarbon family of isomers, plotted versus the hydrocarbons carbon numbers. This data was extracted via RSIM integration of the molecular ion peaks. Click to Enlarge. We consider the plot shown in Figure 6 as very informative because it clearly shows the relative abundance of isoprenoid isomers compared with other isomers over a range of carbon numbers. 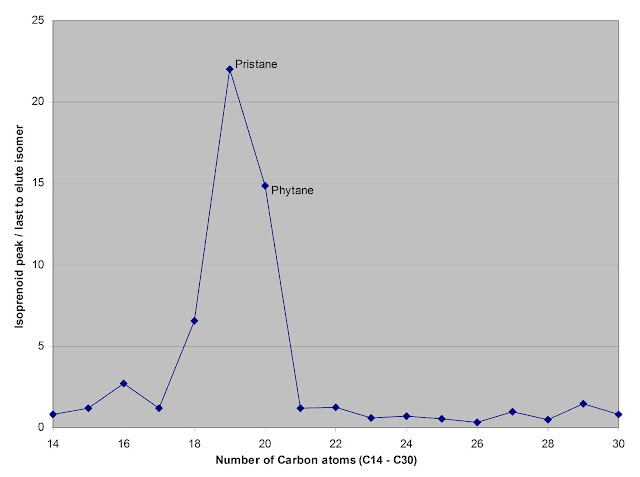 As shown for sample "A", pristane has the highest relative isoprenoid abundance (versus the other non-isoprenoid isomers) in the C19 family of isomers with phytane its nearest competitor in the C20 family. The full width half maximum in this plot is only about 3 carbon atoms wide. Further research is needed to determine how the shape of this isoprenoid relative peak intensity is related to the age of oil. We believe that the relative peak height of such plots and their peak widths could vary from sample to sample and as the oil origin is older the peak of such a plot might be smaller and broader due to isoprenoid compounds chemical reactions. Figure 7. Comparison of Isomer Distribution Analysis of Sample "A" (upper left RSIM mass chromatogram) and Sample "B" (bottom left RSIM mass chromatogram). 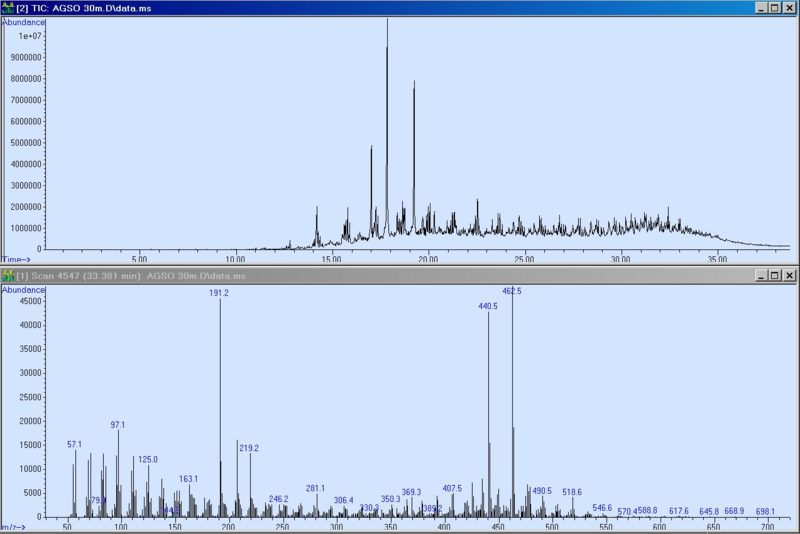 The mass spectrum of the isoprenoid isomer of sample "B" is shown at the bottom right mass spectrum while the upper right mass spectrum is of the first-to-elute, highly-branched isomer (peak at 22 min.) of sample "A". The elution times of these two chromatograms are different since they were taken at different times and analytical conditions. Click to Enlarge. In Figure 7 we compare isomer distribution analysis patterns of two different organic geochemical samples "A" and "B". As shown, while the late-eluting isomer distributions are somewhat similar, there is a major difference in the relative abundance of the second eluting peak (an isoprenoid isomer) which is relatively much higher in Sample B than in Sample A. Note that both of these isomer distributions exhibit an isomer that elutes before the isoprenoid hence should be an even more highly branched isomer. As shown, Figure 7 demonstrates that isomer distributions can strongly depend on the sample origin and its other details, hence may contain valuable information. We believe that Isomer Distribution Analysis (IDA) is a new and potentially powerful tool for organic geochemistry analysis that can shed new light on oil origin, date of production, and method of cleaning or processing. In contrast to biomarkers in oil, IDA can serve well for trace oil spill source characterization, arson investigations and other trace level oil characterization analysis. While some of the statements on this note are not yet proven, it is reasonable to believe that isomer distribution analysis contains significant amount of new and untapped information that can help in oil explorations. The type of plots displayed in Figure 6 above might also serve for further refinement of isomer distribution information by focusing on the abundance and fate of isoprenoid hydrocarbons in the oil. Consequently, as a new method of oil characterization which is based on Cold EI, the Aviv Analytical 5975-SMB GC-MS with Cold EI might add important new information and insight into organic geochemistry analysis.